One of the most popular extensions for Firefox 3 is Adblock Plus. This extension allows users to block ads and banners from the sites they navigate to. Even though Internet Explorer 7 & 8 both have add-ons such as Firefox, there is no free Adblock Plus for them. Fortunately for Internet Explorer 8 fans, now there is a way to build your own adblock filters. 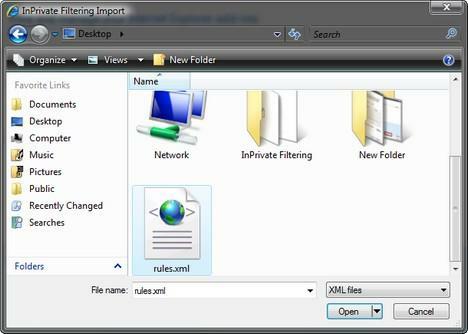 In this article I will show you where to find those filters and how to import them into your Internet Explorer 8. 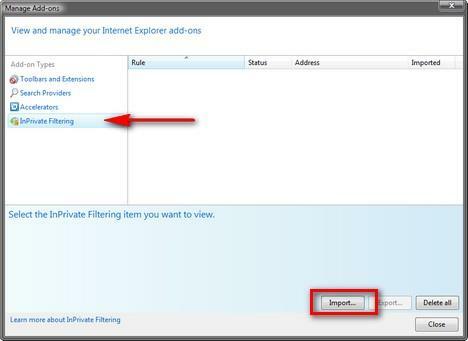 First, you need to download a list of filters adapted from the adblock plus list for Internet Explorer 8. This can be found here or attached at the end of this article. Download the archive and extract its content. NOTE: If you want to have the ad blocking filters running each time you use Internet Explorer 8, then follow the instructions on how to keep InPrivate Filtering enabled forever. 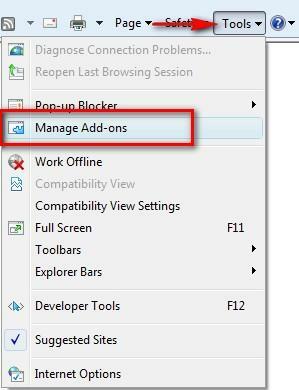 Start Internet Explorer 8, click on Tools and then on Manage Add-ons. In the Manage Add-ons window, click on InPrivate Filtering and then on Import. Browse to the location where you extracted the rules.xml file, select it and click on Open. When the import is done, you will receive a notification such as the one below. Now close the Manage Add-ons window and you are done. If you know other sources for good filters, don't hesitate to share them with us by leaving a comment. Internet Explorer 8 - What's In For The Normal User? I've been looking for an AdBlock Plus alternative for Internet Explorer for some time now, and I still haven't been satisfied with other products. So, thank you for this because it's one step closer to the real thing. It works like a charm, i'm glad i found this workaround. The only thing is (yes, it does block the ad), but it doesn't make it go away like in firefox addon, i mean, instead of the ad there's a blank picture in place where the ad used to be. That's a bummer, anyway is still aprecciated. So far I've been happy with it. Blocks pretty well. I just tried simple adblock and it works perfectly. Not powerful enough, i just use adblock pro. Simple-adblock (or S.A.D. as I call it) does NOT work and when I emailed them about this a few days ago, they did not even respond, so don't even bother with it. Clearly they don't give a crap. I just tried the adblock filter rules and it works GREAT! I hate the ads on Hotmail the most and now their blocked. Webpages load faster too. Ciprian, THANK YOU so much for providing this info and easy-to-follow instructions!! Simple Adblock DOES WORK! It works with IE6 IE7 and IE8. Simple Adblock uses a DIRECT port of Adblock Plus Easylist filters (which is a combination of Easylist and EasyElement filters). With Simple Adblock you can also specify your own filters, the filter rules are identical to the format defined by adblockplus, hence you can copy your own filter list created with Adblockplus to this file. Looove this so much. Thank you, thank you, thank you! And figured out how to add more ads that aren't on the list. Open a new NotePad, open the Rules.xml file, copy and paste the last line, then copy and paste replacing the url with the new ad you want to block. I just did it and it worked perfectly. Like others, I have been adding to the list. What I do is create my own rules.xml and keep importing in whenever I add something. Mine is JoeBailey_rules.xml and I simply change the extention to .txt to add stuff (change back to .xml to import.) I took the base file with one "item" from your original and "copy, paste, modify" new items as I need. I keep the one you posted intact and import it first then modify and keep importing mine. I run Xp and and IE 8 and Ihave had zero success with any and all ad blockers. I am really frustrated. I loaded the filters and I'm running "in private". I still see the ads on yahoo mail. I also tried simple ad blocker. This caused my IE 8 to crash/freeze the minute I opened a second tab. Got tired of that after seven restarts in 2 hours. The only reason I am looking for an ad blocker now is the virus vector via java and flash in ads. I've been nailed twice and I am tired of it. I dont want to be forced to another browser. Been a number of years since you created your blocklist. Could you possibly do an updated list?